Keeping it simple, keeping it cool. Fresh, crisp green beans, lightly and barely cooked then chilled. Drizzled with walnut oil. Scattered with toasted walnuts and fresh thyme leaves. Sprinkled with crunchy salt & crumbles of blue cheese. Served with anything off the grill or as one of a trio of summer salads. Simple and cool, like lemonade and a run through the sprinkler, just what we need, just as we need it. Lots and lots of water…a big pot full of roiling, boiling water. Lots of salt…way more than you think you’d need. As usual when presenting vegetables, I’ll leave quantities safely in your own able hands. Here are just a list of ingredients & a few guidelines. NOTE on salt – if you enjoy salt, you’ll much prefer the crunchy little bits of a coarser, slower-dissolving kind in a dish like this. It adds another element & a distinctive texture to this simple dish. Bring a big pot of water to boil on the stove. Add at least a tablespoon of salt. Prepare a bowl of ice water. Wash and trim green beans. Drain in collander and quickly drop into ice water. Allow them to cool about 1 minute. Drain in colander and then roll gently in kitchen towel to dry as thoroughly as you can. Chill. Lightly toast walnuts & coarsely chop. 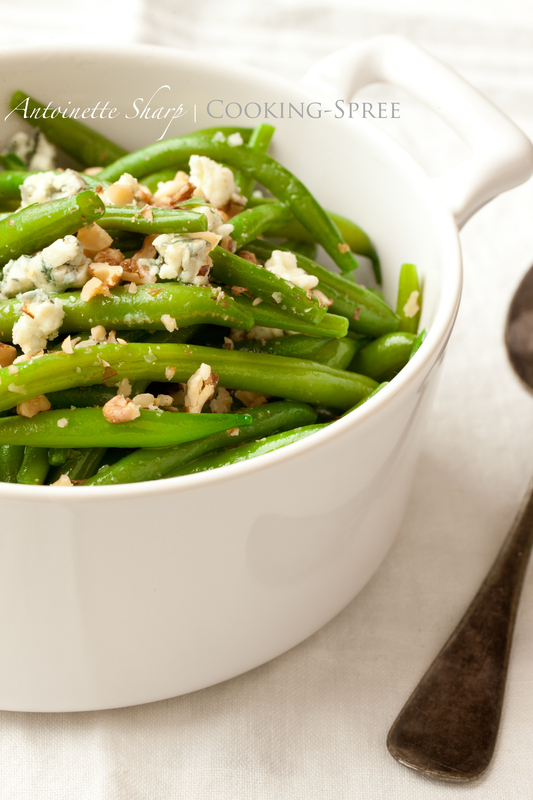 Toss green beans with a light drizzling of walnut oil, chopped walnuts, thyme leaves, coarse sea salt and top with crumbles of your favorite blue. ps…this very same dish does well served warm. Sounds like a perfect snack when you’re between meals and search in the refrig for a quick, refreshing tidbit to munch. Yes, Ronnie, that too! A crunchy refreshingly tasty little snack too! Your green beans look beautiful in the photos, Antoinette, and I like the flavors you’ve used, but not the salt content. I nuke my green beans with no salt at all (bleu cheese is salty anyway) in a little water for two to three minutes, depending on how tiny they are, or I toss them into pasta water for thirty seconds if I am eating them with pasta (I don’t salt pasta water either, since I am often eating pasta either with cheese or with a highly seasoned peanut sauce). 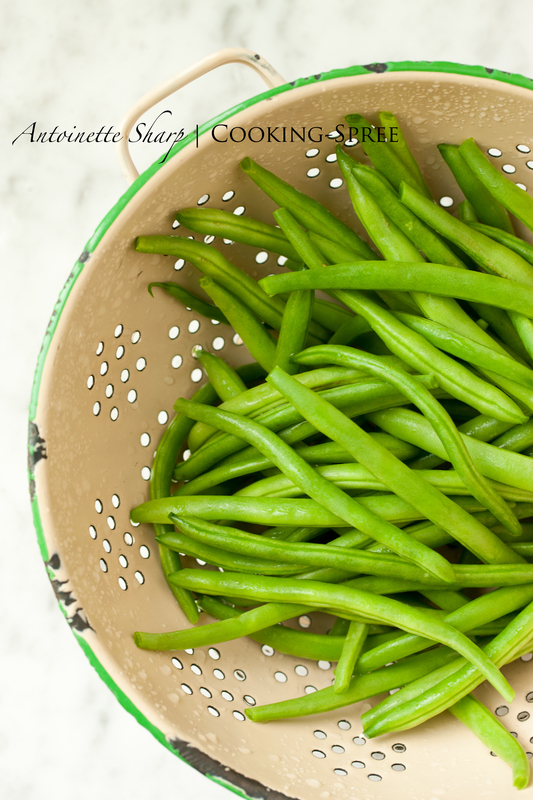 Thanks for sharing your alternate tips on cooking green beans Sharyn. I microwave very little so wouldn’t have thought of that. I generally don’t like what the microwave does to the texture of foods, but haven’t tried it on green beans. We don’t use large quantities of blue cheese here…very little at a time. It seems to impart deep delicious flavor in such small amounts that I don’t worry about the salt content. For those watching closely their salt intake though, that’s definitely something to consider. Thanks Sharyn. I’ve been preparing green beans in my home just the way you described, for years. It truly is the secret to good green beans! Can’t wait to try this summer variety! And good salts, really do make such a difference!! thanks Greg. Nothing unusual, but it’s really tasty. Those are some stunning pictures of green beans. So simple but yet so yummy. It seems so counter-intuitive to cook something green and nutritious in lots of water. It runs contrary to what we’ve been taught. But you get the rationale here, right? Makes total sense to me, and the proof is in the puddin’ as they say. 🙂 Thanks and xo Kelly Belly! Simply perfect. I’m glad to see that you are an advocate of Maldon salt. Even though the Vendee is world famous producer of sea salt, I still get friends to bring me Maldon salt from England. I’m crazy about Maldon salt! We’re lucky that here in Portland we have a store called The Meadow – (their only other is in NYC.) They have virtually every kind of salt – (an amazing assortment! – Himalayan pink, Maui black, applewood smoked, truffle, etc etc etc) – as well as chocolates and beautiful flowers. That’s all they sell. And they’re thriving! I have a few salts that I use regularly, but Maldon’s one of my very favorites! I’m glad you like (and your mom would!) the sound of these. This is the one year recently when I haven’t planted a garden, and I’m so missing it. Green bean vines wrapping around their tall bamboo teepees were the star of the show. I’m missing everything about them. So here I am, already looking forward to next summer. (tsk-tsk I know I shouldn’t.) BUT, thankfully we have lots of farmers growing them nearby and I’ve got my sources – though no longer within barefoot walking distance! 🙂 But lucky lucky you! Beautiful simplicity. My whole family loves beans and I love your preparation! I like to serve them with their adorable little tails on, such cute little curlicues! Very nice! I wish I had green beans on hand. Must add them to my list. Absolutely amazing! Good tips, even better photos. They look so fresh and delightful! Oh how I wish I saw this earlier today! 🙂 THank goodness for tomorrows! Furry, Movita? What, luv? You don’t shave your green beans? And the way you describe how to cook and blanch them – superb!! I learn so much from reading spree :). Thank you, dear one. Lovely colander! Beans sound delish too, I usually toss mine with flaked almonds and sherry vinegar, definitely going for walnuts next time! Beautiful new kitchen btw soooo jealous! Green beans are one of summer’s best we think. Love having lots of ways to change them up a bit, and like you, we like them with almonds too.